The beautiful Christmas Invitation (picture to the right) can be used to invite your church members and local community to your special Christmas event and/or activities. 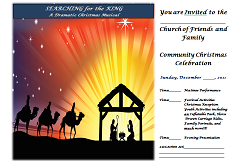 The invitation below is designed for a Dramatic Christmas Musical, but can be modified for another Christmas special event. It is two sided and on the back side of invitation is a "Need to Know" to draw the community to salvation. You can draw the community and witness at the same time with special Christmas event. Then ends with this prayer: You may receive Jesus by praying like this – "Dear Lord Jesus, I ask you to come live in my heart and to forgive me of my sins. I want you to take over my life and lead me day by day. Thank you for coming to live in me! Amen"
Church Christmas activities are so much fun for the youth and the adults. Make this Christmas holiday special for your church and community by creating one of these special events that makes a very lasting memory in the minds of the community. Let's help them remember just what Christmas is really all about! Return to Printable Christmas Activities from Free Christmas Invitation.